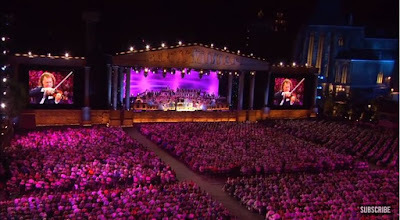 In reviewing the 64 versions of Hava Nagila that we've posted since starting Jewish Humor Central in October 2009, we realized that we never posted the one that has more views (more than 10 million) than any other -- the version by Andre Rieu. Rieu is a Dutch violinist and conductor best known for creating the waltz-playing Johann Strauss Orchestra. Together they have turned classical and waltz music into a worldwide concert touring act, as successful as some of the biggest global pop and rock music acts. Rieu's father was conductor of the Maastricht Symphony Orchestra. Showing early promise, André began studying violin at the age of five. From a very early age, he developed a fascination with orchestra. Rieu created the Johann Strauss Orchestra in 1987 and began with 12 members, giving its first concert on 1 January 1988. Over the years it has expanded dramatically, nowadays performing with between 80 and 150 musicians. Rieu and his orchestra have performed throughout Europe, North and South America, Japan, and Australia. The size and revenue of their tours are rivaled only by the largest pop and rock music acts. This performance of Hava Nagila took place in a huge concert hall in Maastricht, the Netherlands, where Rieu makes his home.